Cloudland Canyon Overlook. Image courtesy of the Georgia Department of Natural Resources. If you're looking for a fun way to get outdoors, there are so many things close by to explore. While we wait for the weather to clear, here are a few fun things to think about doing at some of our nearby State Parks! Once the sun comes out again, it will be nice to have a few ideas. Beginner hikers can catch a spectacular view of Georgia, North Carolina and Tennessee from Black Rock Mountain State Park’s scenic overlook, and then drive down to Black Rock Lake for an easy 0.85-mile stroll on the Lake Loop Trail. Hikers will cross wooden bridges overlooking Taylor and Greasy Creek, and an 80-foot bridge spanning the southwest corner of Cricket Cove. Another way to see a scenic overlook is the short 2.2-mile hike on the Tennessee Rock Trail. The park’s 10 cottages are clustered on the edge of the mountain, offering views of the Georgia mountains and town of Clayton below. Straddling the edge of Sitton Gulch, Cloudland Canyon State Park’s vantage point from the western edge of Lookout Mountain offers spectacular views into the canyon and its surrounding woodlands. Hike the one-mile roundtrip Overlook Trail along the canyon’s rim to the main overlook for the best view in the park. Another trail to explore is the West Rim Loop Trail that offers five miles of backcountry trail. The trail climbs out of the canyon onto the canyon’s plateau, where hikers can see magnificent views of Trenton, Georgia. The Sitton’s Gulch Trail is the most difficult and it dips into the deep canyon down 600 metal steps. Remember to look up into the canyon when you reach the bottom for a beautiful view. One of Georgia’s most spectacular sites is Tallulah Gorge State Park, a two-mile-long and nearly 1,000-foot deep gorge. From above, state park’s the East and West Rim Trails meander along the edge of the cliffs and showcase the winding river far below. Trek down the stairs to the suspension bridge, swaying 80 feet above the rocky bottom, to get a closer look at the river and waterfalls. Backcountry campsites two and three are located off the North Rim Trail and closest to scenic overlooks of the gorge. 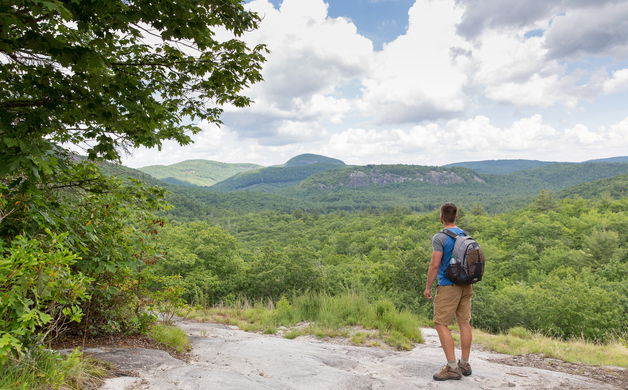 Visitors to Vogel State Park can hike the Coosa Backcountry Trail, a 12.5-mile loop, and add on additional mileage to turn a hike into an overnight trip by linking up with the Duncan Ridge Trail. The Coosa Backcountry Trail begins in Vogel State Park and loops through the Chattahoochee National forest crossing three ridgelines, offering beautiful views of the Chattahoochee National Forest and Blood Mountain Wilderness. Ever wanted to hike along the Eastern Continental Divide? The moderate 2-mile loop at Whiteside Mountain takes you on a trek over rocks that are estimated to be 390 to 460 million years old. The ridgeline features a number of overlooks where hikers can stop to take in the incredible views from Georgia to North Carolina’s Appalachian Mountains. Known as the “Jewel of the Appalachians,” the mountain’s name is inspired by the bald, rocky, white-streaked quartz and feldspar on the south-facing rock. At the summit, hikers will reach the highest vertical drop (750 feet) in the eastern United States, where they can safely look over the wire fencing and down the steep granite rock face, that was caused by years of erosion. During the spring and summer, hikers should keep an eye out for the endangered peregrine falcons which are known to occasionally soar above, or nest on one of the many rock’s outcrops. 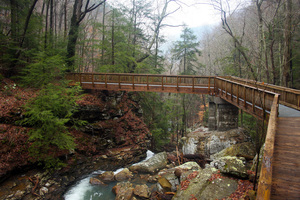 The Cloudland Connector Trail (CCT) is one of the least-known trails in Georgia State Parks. It starts in Cloudland Canyon State Park but it extends for 21 miles out of the park and into Five Points Recreation Area, a multi-use trail system on Lookout Mountain. Terrain throughout the CCT is single-track trail, and mountain bikers will experience stacked boulders, rollers, jumps, steep slopes, and even some coal pilings from the state’s historical mining practices. The mountainous terrain and scenic overlooks at Unicoi State Park make the exclusive 7.5-mile mountain bike trail a top pick for experienced riders. A figure-eight loop crosses over both sides of Smith Creek. Because of the valley, expect long, tough climbs to test your muscle strength and endurance. The single-track trails cross technical, packed dirt with sharp turns and an exhilarating downhill where riders can reach 30 miles per hour. 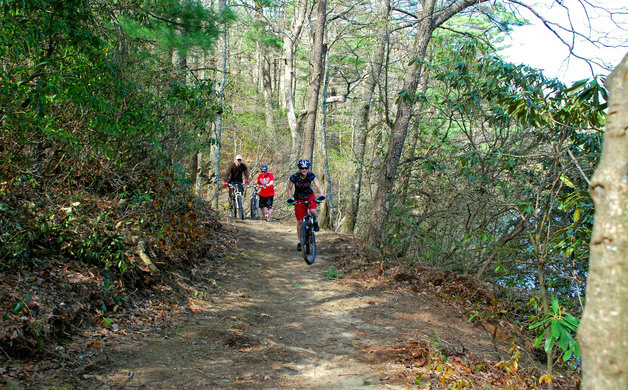 Mountain bikers will scream down invigorating downhills, pass scenic overlooks of the North Georgia Mountains, and bump over rocky single track on Fort Mountain State Park’s mountain bike trails. The East/West Loop tests endurance on 14.6 miles of trails, including a technical downhill section through a powerline alley. Riders that are a fan of switchbacks will enjoy the seven mile intermediate Cool Springs Trail winds back and forth down 800 feet of vertical descent. What goes down must return, and many of these trails climb uphill for up to three miles. A $3 permit fee is required to ride these bike trails and can be purchased at the park office. Looking for an added challenge? Check off more than 68 miles of mountain bike trails at Georgia State Parks with the Muddy Spokes Club. The club highlights designated trails at 11 state parks: Fort Mountain, Fort Yargo, Magnolia Springs, Mistletoe, Panola Mountain, Red Top Mountain, Richard B. Russell, Tallulah Gorge, Unicoi, Victoria Bryant, and Watson Mill Bridge. Trails range in difficulty from easy, predominantly gravel paths to difficult, single-track technical trails. To join the Muddy Spokes Club, mountain bikers buy a $10 membership card which they will get punched at the park visitor center after completing each trail. Smithgall Woods State Park, just outside Helen, Georgia, is a sprawling 5,663 acres of woodlands that sits on the Dukes Creek watershed. Dukes Creek is rated in the top 100 trophy trout fishing streams in the country by “Trout Unlimited.” The 4.5 mile section of the creek that flows through Smithgall Woods State Park is private, allowing only 15 anglers to fish during each daily session. Prospects include rainbow and brown trout at 16 inches-plus. Trout fishing is open to the public Wednesday, Saturday and Sunday, and the creek is easily accessible through parking by the State Park’s visitor center. Trout season runs from the last Saturday in March through October 31. All fishing is catch and release only. The picturesque Western North Carolina Fly Fishing Trail in Jackson County, North Carolina, features three Mountain Heritage Trout Streams, offering some of the best trout waters to fish in the state and the Southeast. 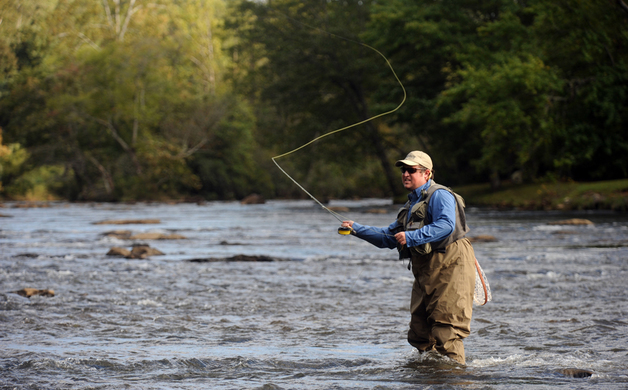 Jackson County boasts the state’s longest contiguous stretch of North Carolina Mountain Heritage Trout Waters, including the Tuckasegee River, one of the most popular spots on the WNC Fly Fishing Trail. Due to its lake-fed water, which remains a constant temperature no matter what time of year, trout are abundant. The Tuckasegee River participates in a delayed harvest program, where more than 92,000 trout are stocked in the river five times a year. The delayed harvest draws sport fisherman from around the country to Jackson County’s waters for catch-and-release fishing, at its prime from October through May. 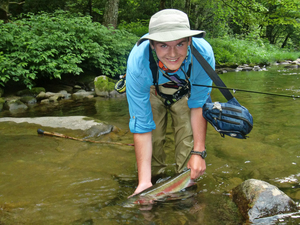 To help fishermen find the best locations, the WNC Fly Fishing Trail has a map, available for download online. The trail boasts more than 4,600 miles of water and is the first and only fly fishing trail in the country. All content courtesy of the Georgia Department of Natural Resources and images of the fly fishing trail courtesy of Jackson County TDA.